DUENDE is an association between international artists dedicated to Ensemble Performance. With partners from Greece, England, Australia, China and India, DUENDE creates absolutely “alive” physical theatre performances in theatrical and non-theatrical venues. Dedicated to consistent research and development, DUENDE creates artistic pieces which defy classification. DUENDE is dance, text, physical theatre and live music. DUENDE combines extremely structured choreography with improvisation in order to create complex narration presented in an immediate, authentic way. DUENDE’s plays are unique and always absolutely alive. DUENDE was established in 2010, by his Artistic Director John Britton. He has directed over 50 plays in dance, theatre, opera, circus and other multidisciplinary performances. Aliki Dourmazer is a Founding Member of DUENDE along with Eva Tsourou and Eillon Morris. She is responsible for the Voice and Singing education, research and attribution, based on her own approach, in every production and educational activity of the team. DUENDE commits with passion to international collaborations. In 2010, DUENDE created its first version of “Shattering Man” (adaptation Macbeth) which was presented in the UK and the following years a second version of this production was presented in the University of Hudderfield (UK). In 2011 DUENDE created a solo performance, whose concept and acting belongs to John Britton. The performance toured in England, Australia and Greece. In years 2012 – 2014 DUENDE created- a large scale collaboration with students from “Drama Department” of University of Huddersfield, England. 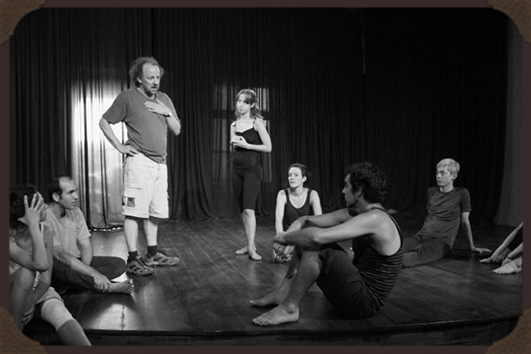 In July 2012, DUENDE organized and the 1st International Residential Workshop ‘Performing at the Edge’, a 2 week intensive training and performing on Ensemble Physical theatre at Fara, Lesvos island, where it also created a new performance piece which was introduced in Mitilini. ‘Performing at the Edge #6’ runs for the 6th year in June 2017. In September 2015, DUENDE launched the ‘Duende School of Ensemble Physical Theatre’ based in Athens, a two and half month intensive training and performance educational program attracting students from all over the world. John Britton is the head teacher and director, Eva Tsourou dance teacher, choreographer , Aliki Dourmazer voice teacher and song consultant and Eilon Morris rhythm coach. The school will run for its 3rd year in Athens in September 2017.